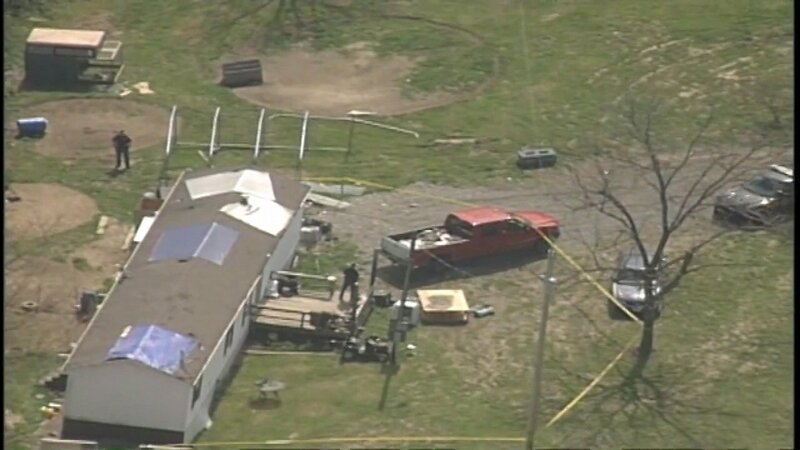 PIKETON, Ohio -- Authorities urged residents to be cautious in this part of rural southern Ohio heading into the weekend as the search continued for whoever fatally shot eight members of a family at four different properties, including a mother in bed with her 4-day-old baby nearby. Investigators interviewed more than 30 people hoping to find leads in the deaths of the seven adults and 16-year-old boy whose bodies were found Friday in homes southwest of Piketon. All victims were shot in the head, authorities said, and it appeared some were killed as they slept. The 4-day-old and two other small children were not hurt. Authorities didn't release the victims' names but said they're members of the Rhoden family. Investigators said none of the deaths appeared self-inflicted, so they believe at least one assailant is at large. A motive for the slayings isn't known, authorities said, but they urged surviving members of the Rhoden family to take precautions. Pike County Sheriff Charles Reader also recommended area residents to be extra wary. "This really is a question of public safety, and particularly for any of the Rhoden family," Attorney General Mike DeWine said. Reader said Friday night that authorities had met with more than 100 relatives and friends of the Rhoden family at a church. DeWine dismissed a report that the people authorities questioned included a person of interest. The first three homes where bodies were found are within a couple miles on a sparsely populated stretch of road, while the eighth body, that of a man, was found in a house father away. Authorities didn't release any information on what kind or how many weapons might have been used or whether anything was missing from the homes. Goldie Hilderbran said she lives about a mile from where she has been told a shooting took place - news she received from a mail carrier who told her deputies had an area blocked off. The FBI in Cincinnati also said it was closely monitoring the situation and has offered assistance if needed. Economically distressed Pike County, about 80 miles east of Cincinnati on the western edge of Appalachia, has about 28,000 people, more than a quarter of whom live in poverty. The area is home to a shuttered Cold War-era uranium plant that's still being cleaned up.